WCA! announces an exciting, innovative and inspiring evening of Screenings and Awards to be held at Cineworld on Thursday 6th September and networking afterwards. 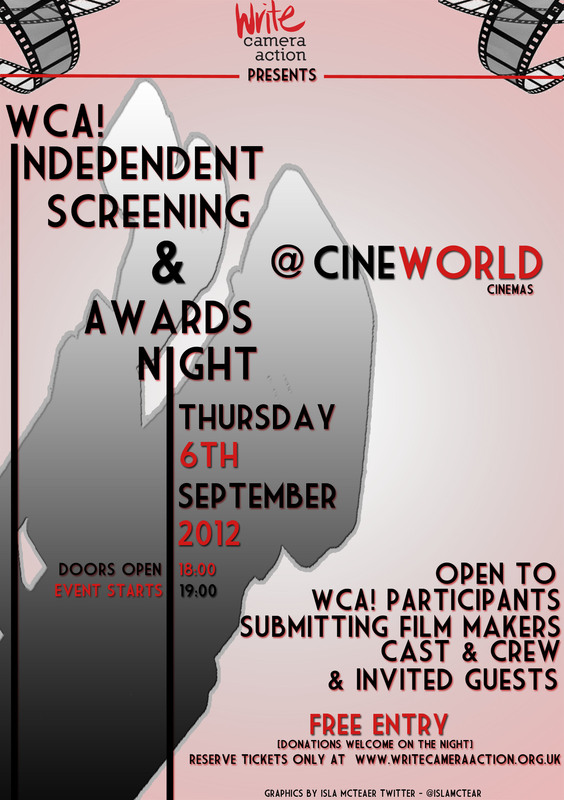 The evening is OPEN to WCA! Participants, Cast & Crew and Invited Guests. The Judges are industry practitioners supportive of, but independent from, WCA! The evenings Schedule and Judges biogs will be announced mid-late August. Red Carpet entrance, Photographer, Interviews and Awards on the night, so book your tickets, get yer glad rags on and share a great night with us! FILMMAKERS – Free Film Submission(s) Open 16th July – deadline 6th August. See website for guidelines on registering and submitting your film(s) at www.writecameraaction.org.uk and BOOK your parties tickets in advance to ensure availability. If in doubt of eligibility = ask! WCA! is a voluntary run, not-for-profit organisation in support of independent filmmaking. WriteCameraAction! Promo 2011 AWARD CATEGORIES 2011 – Best Screenwriter, Best Director, Best Cinematographer(new 2012), Best Production Design(new 2012), Best Male Actor, Best Female Actor, Best child Actor, Best Editor, Best Producer, Best Overall Production & Prize. « UWS “Open For Business” : Day 2 Of Shoot.